Municipalities on Gran Canaria don't come more picturesque than the little town of Tejeda. Although it can't quite match neighbouring Artenara for views of Tenerife's monstrous volcano "Mount Teide", you'll enjoy close-up views of the Roque Bentayga Nature Reserve and the jutting rock formation "Roque Nublo". Tejeda is at its prettiest in spring, when you'll find the flowering almond trees in full and bountiful bloom. The rock formation - Roque Nublo (Clouded Rock) - is one of Gran Canaria's most distinctive landmarks. And if you want to venture and touch it, you can make the journey on foot, starting from Tejeda. It's a comfortable walk from La Goleta carpark and a longer, more challenging hike from the village itself. Some other treks which start in Tejeda include the hamlet of La Culata where local farmers still tend the fields with donkeys. 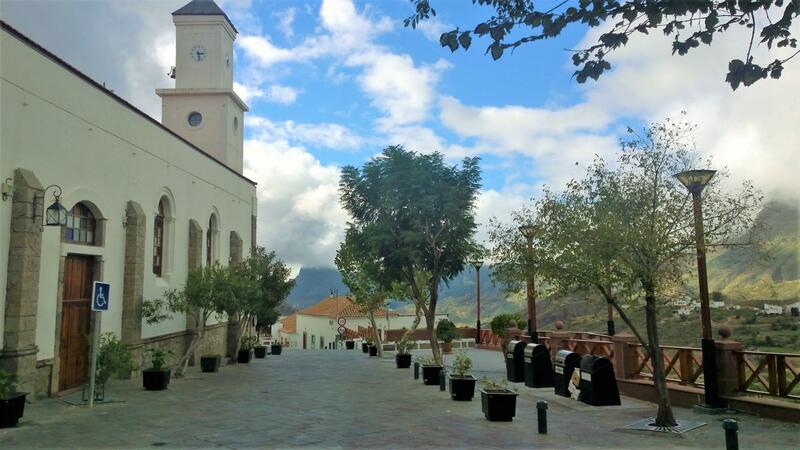 You can also enjoy a pleasant and picturesque walk to Cruz de Tejeda, where you'll find a number of bars and restaurants to refresh you after your exertions and explorations. Natives of Las Palmas de Gran Canaria will tell you how they like to take a break from the city every now and again. They called it "cambio de aire" - a change of air. Whilst you can sunbathe in Tejeda, temperatures do drop at night and everybody visiting from the capital make sure to bring a warm jacket. 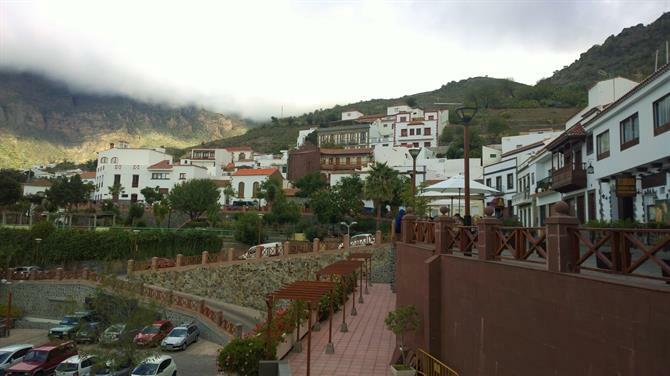 If you want Tejeda for yourself, it's best to visit during the week because lots of wealthy residents of Las Palmas de Gran Canaria have their second home here, which they travel to at weekends. If you're not feeling particularly energetic, you can enjoy a "change of air" dining al fresco on one of Tejeda's tranquil restaurant terraces. On approaching Tejeda, the closer you get, the better you'll be able to make out its main building. That of the Iglesia de Nuestra Señora del Socorro (Church of Our Lady of Help). 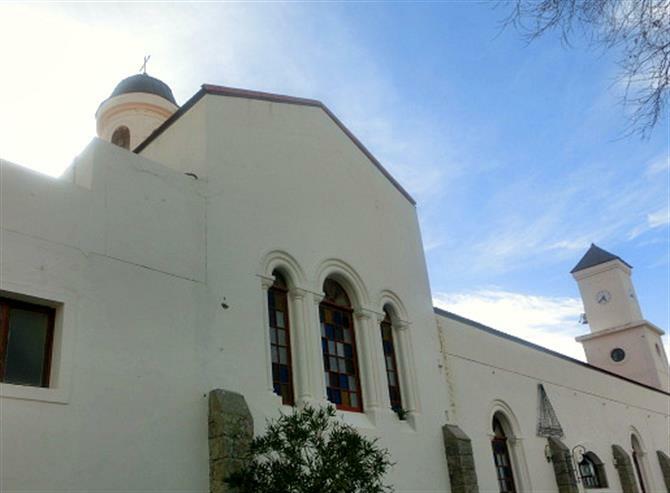 Built in 1921 as a replacement of the church that burnt down the previous year, this rectangular building has three naves and large windows allowing the natural light to illuminate the beautiful altarpiece inside. Travelling by car from Las Palmas de Gran Canaria, you should allow around an hour for your journey. Take the GC-15 which passes through Santa Brigida and Vega de San Mateo. 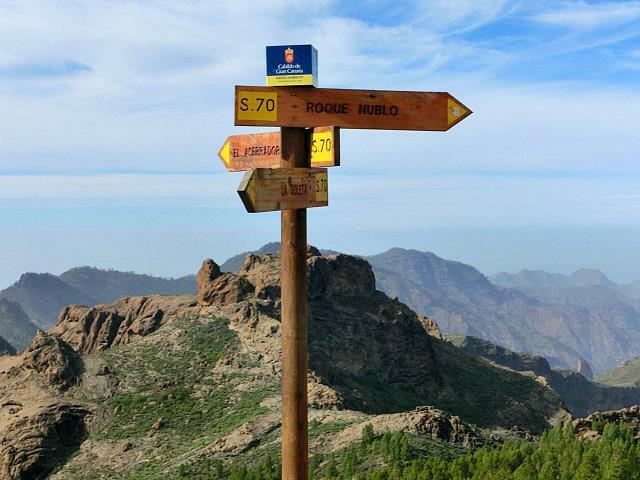 You'll actually reach Cruz de Tejeda before Tejeda itself. Many believe the cross there designates the dead centre of Gran Canaria. Tejeda is a haven for artisans. 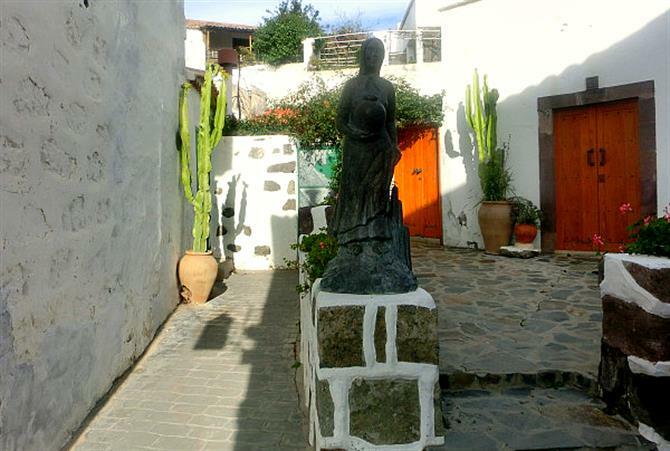 It's the birthplace of perhaps the Canary Islands' greatest-ever sculptor, Abraham Cárdenes. You can view some of his most notable sculptures at the village's Museo de Esculturas de Abraham Cárdenes. Opening Hours: Tuesday to Friday, 11:00 - 15:00. Saturday, 11:30 - 14:00. Sunday and Bank Holiday, 11:30 - 16:00. 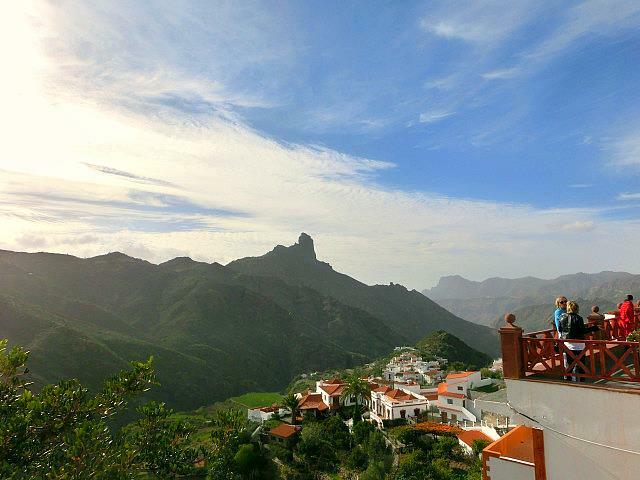 If you want to get away from it all on GC, head to the centre of the island and Tejeda. Especially during the week as it's a popular weekend retreat.